Jane Shore's presence in the busy opening scenes of Olivier's Richard III gives us a sense of King Edward's vulnerability—the next scene shows us his brother's strength and determination. At the same time, the scene establishes a powerful sense of intimacy between Richard and the movie audience. We start with the camera moving toward the palace door, which opens to reveal Richard leaning on the throne. When the door shuts behind the camera, Richard turns and looks at it. He walks forward, limping slightly, blinks a few times, and looks directly at the camera as he begins the play's famous opening soliloquy: "Now is the winter of our discontent / Made glorious summer by this son of York." 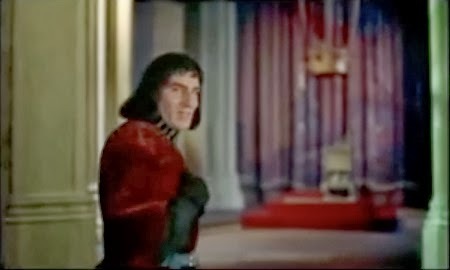 After two thirds of that speech, Olivier switches to a soliloquy from the preceding play, The Third Part of Henry VI, in which Richard reveals his desire for the crown. 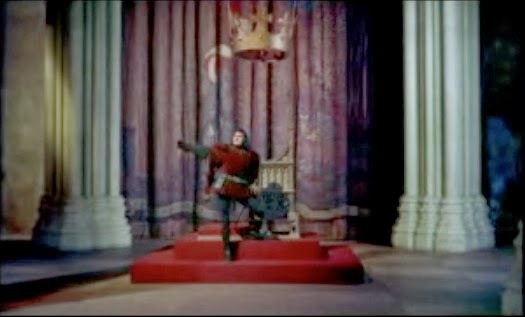 The combined soliloquy demonstrates Olivier's skillful blending of the techniques of stage and film acting. For instance, in a way that would be too subtle to be seen in a theater, he highlights lines with his eyes, lowering them as he speaks of the clouds that loured upon the House of York being buried in the deep bosom of the ocean (3-4), opening them wide as he talks of frightening his adversaries' souls (11). He speaks directly, often quietly, to the camera, creating a sense of closeness with the movie viewer. Torment myself to catch the English crown. In a gesture that would be seen at the back of a large theater, he makes a backhanded swing with an invisible ax as he says, "from that torment I will free myself, / Or hew my way out with a bloody axe" (181-82). He then walks toward us, getting closer than he ever could to a theater audience as he talks of how he can smile and kill at the same time. The camera backs away, and Olivier follows as he reveals the terrifying extent of Richard's duplicity. The movements of actor and camera make us feel that we are trying to get out of the way of this deadly chameleon. 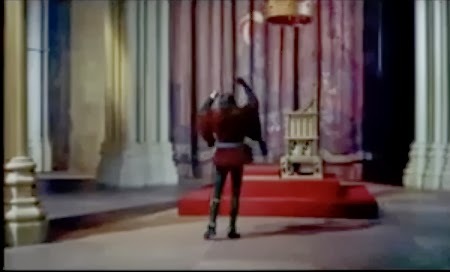 Olivier concludes the combined soliloquy with Richard telling us that with his deceptive skills, he will surely win the crown—the conclusion of the soliloquy from The Third Part of Henry VI. We might have expected him here to return to Richard III's opening soliloquy. Instead he has Richard lead us to a scene that illustrates our villain's demonic skills: the seduction of Lady Anne.